Introduced from Europe around 1900, this pest is now common throughout eastern North America wherever true firs are grown. Infestations are also present along the Pacific West Coast. 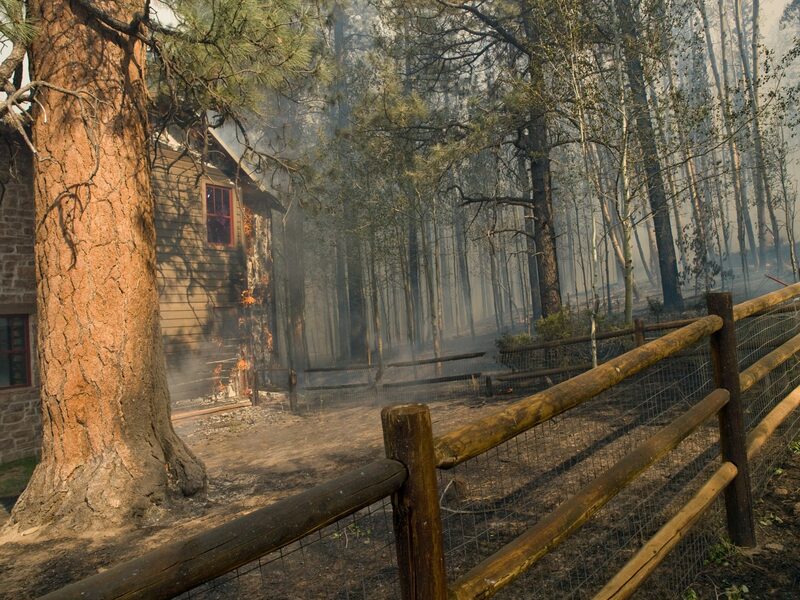 All true firs, Abies, can be attacked but balsam fir and Fraser fir are the most common firs trees attacked. Both western and eastern Hemlocks are susceptible to infestation, with a higher mortality rate exhibited in the eastern hemlock. This pest commonly stunts and kills firs. Adelgids feeding on branches and twigs cause severe gouting and prevents the growth of buds and needles. Heavy infestations on the bark of the trunk causes the formation of abnormal vascular tissue and sudden death in two to three years. 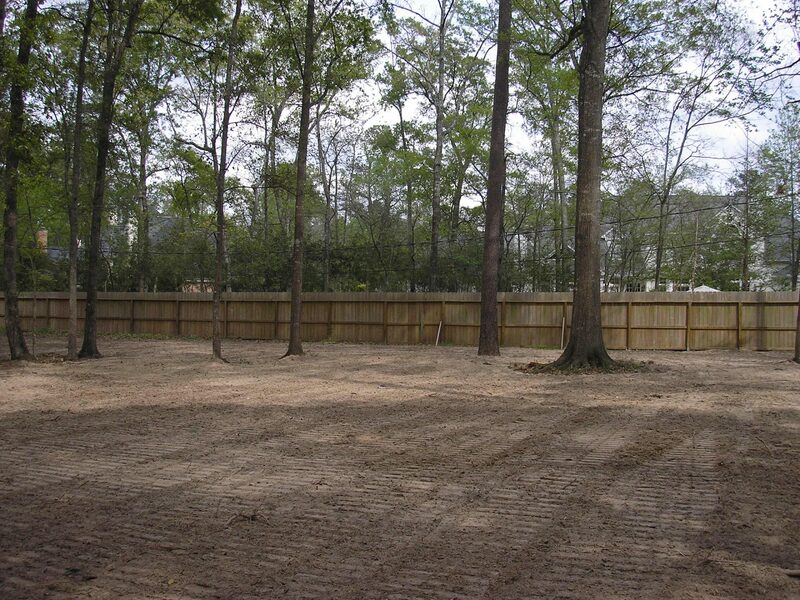 The abnormal growth is called compression wood and makes the branches brittle. In North America, the balsam woolly adelgids are all females and most are wingless forms (sistentes). Adult females are a dark purple-black color and produce a thick mass of wool-like waxy strands over their bodies. The eggs are deposited into this wax. These cottony masses may be present as individuals along branches and twigs or as continuous masses coating the trunk and lower branches. This Adelgid has two generations per year over most of its range with an occasional third generation. The first instar nymphs overwinter as small, uncovered, dark brown forms attached to the bark after inserting their mouth parts into the vascular system. Apparently, these nymphs cannot survive winter temperatures much below -5°F. This is why best survival and highest populations usually occur on the protected areas of the lower trunk and branches. Dormant, overwintering nymphs become active in late April and molt into second instars by early May. Another two molts occur rapidly where the second instars transform to the third instar and adult stage. Spring adults are usually present by late May. The nymphs and adults are covered with the woolly waxy coating and eggs are soon deposited. Each female produces 50-200 eggs. The eggs hatch over a three-week period and the new adults are present by late July. 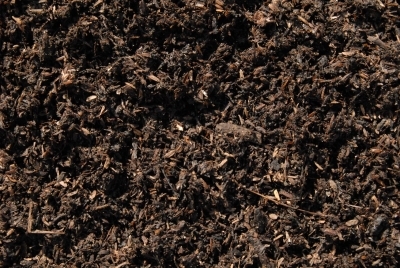 Eggs are produced throughout August and the new crawlers hatch out from August until the first frosts of winter. Remaining eggs die and settled nymphs enter a dormant state. Rarely, winged forms are produced but spread of these insects appears to be by wind blowing of the crawlers or transport on birds and other animals. 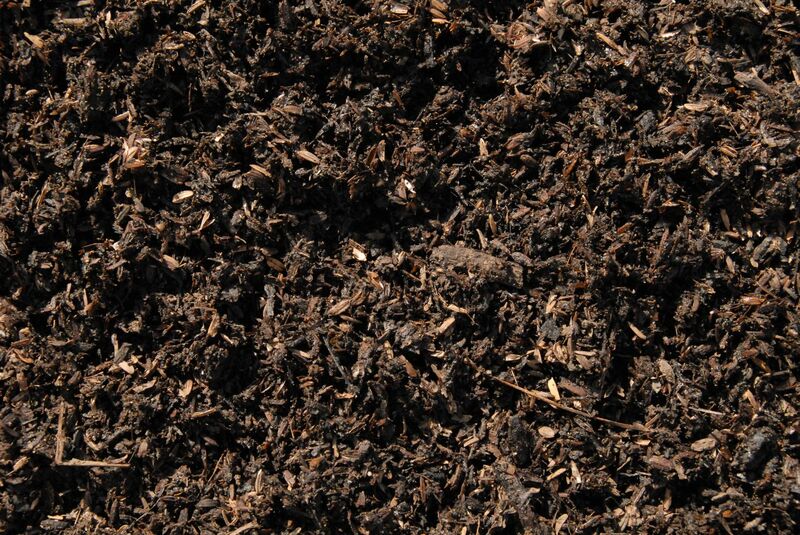 Most of the initial infestations are probably the result of transport of infested seedlings. Several predators have been imported to control this pest, but none seem to be effective. Control in Christmas tree plantations is probably best accomplished by obtaining pest free seedlings and keeping fields isolated from surrounding stands of native firs which may be infested. Use a high-pressure sprayer during the first generation- crawler stage. When Adelgid is found, treat the tree prior to bud break of the following season. Cut and burn heavily infested trees. Do not cut during crawler activity. Do not leave infested trees in the field. Option 1: Cultural Control – Quarantine and Isolation – Since this insect rarely forms winged stages, only the crawlers can be transferred from tree to tree. Obtain Adelgid free seedlings which have been grown away from larger balsam or Fraser firs. Completely harvest a field before planting new seedlings. Eggs, nymphs and adults can survive on cut trees for months so destroy any remaining cut trees or tree parts. Option 2: Chemical Control – Pesticide Applications – Registered insecticides should be applied when the crawlers are active. The first generation of crawlers found in June are the best to treat. Thorough coverage is essential and two applications may be necessary if cool weather extends egg hatch. Oils and soaps applied to dormant nymphs have not produced satisfactory results. Option 3: BEST RESULTS Hemlocks with a large population of adelgids are best treated with a combination of two products Begin by applying a fast moving highly mobile insecticide called Transtect to provide a quick kill of the insects. Follow up by applying a long lasting (up to 2 years) product that will protect the tree from re-infestation called Xytect. Xytect™ moves rather slowly into the tree, often taking up to 90 days, so it is best supplemented with a fast acting product like Transtect™. Transtect is only needed one time as the initial treatment. Xytect™ should be applied every 2 years to prevent re-infestation. 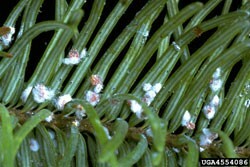 Eastern Spruce Gall Adelgid: The adult female is a small, bluish-green, sucking insect covered by cottony, waxy strands. The eggs are dark olive-green to black and oval shaped. Nymphs range in color from yellow to blue-green and can grow to about 1/8-inch long. Norway and white spruces are most frequently bothered, but they are also known to attack red, black and Engelmann spruces. Colorado blue spruce is occasionally damaged. Cooley Spruce Gall Adelgid: This insect most frequently infests blue spruce (Colorado and Koster), as well as Sitka, Engelmann, and some oriental species. A secondary host is the Douglas-fir, used as a migratory feeding site. Two generations of female adelgids are produced each year on spruce hosts. Immature females will overwinter on branches near the terminal (end) buds. Before the buds open in early spring, eggs will be laid at the base of the buds. When they hatch 7-10 days later, the emergent young nymphs crawl to the base of the needles of tender new shoots bursting from bud sheaths and begin feeding. As they feed, they form their characteristic gall, about 1″ long, which will completely enclose and protect them from weather, disease, and predators as they mature. 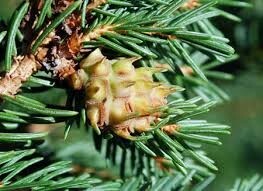 While the gall is forming, the spruce shoot is growing through it, leaving the gall behind at the base of the stem. In August, the galls dry out and crack open, exposing nymphs that will crawl onto the needles and molt to become winged adults. These adults will fly to spruce branches Where about 100 eggs are laid under webs of white cottony wax on the unprotected new growth. Within a week, the eggs will hatch and the second generation of nymphs feed for a short time on new growth before settling near the buds to overwinter. In effect, it takes two years for the Cooley spruce gall Adelgid to complete its life cycle. Eggs are laid in spring under white, cottony wax masses near the terminal bud. 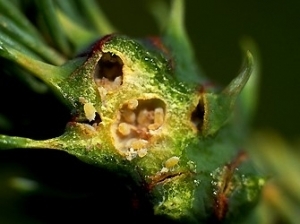 Nymphs will hatch to feed at the base of needles of the expanding buds and form the multi-chambered galls that enclose and protect them. The galls will dry up by midsummer and burst open, exposing the nymphs. The newly emerged winged adults will either continue their life cycle on the primary host spruce or fly to its secondary host, Douglas-fir, to lay the next generation of eggs. Because this generation will overwinter on the Douglas-fir, no galls are formed but feeding damage may occur. When this generation emerges the following spring, usually by mid-June, winged forms are produced that will fly back to the primary host spruce. At this time, they will lay the eggs that emerge to produce the gall-forming nymphs. If the adult stays on the host spruce, it will overwinter on twigs, making it possible to complete its life cycle on either one or two hosts. Injury will be more serious when the insect alternates between the two. The eastern spruce gall is pineapple-shaped, greenish-purple, and about 1/2 to 1″ long at the base of seasonal twig growth. The Cooley spruce gall Adelgid produces a 1-3″ long gall on the tips of new growth of host spruces. 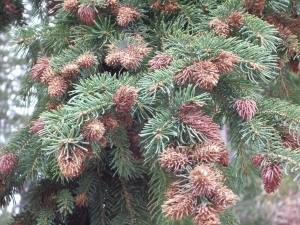 If they have settled on Douglas-fir to feed and overwinter, the feeding will cause prominent yellow spots on needles that can become bent and distorted. If an infestation is heavy, the tree can become so covered with the characteristic white egg masses that it can look snow-covered.